In this thrilling book master historian McCullough draws on the immense riches of the Wright Papers, including personal diaries, notebooks, and more than a thousand letters from private family correspondence to tell the human side of a profoundly American story. This book is more than just about who is considered “First in Flight”, but more about the humanity behind two industrious brothers and their upbringing which enabled them to change history as we know it. It is interesting to note, that in 1893, through the influence of Bishop Wright, Wilbur and Orville’s father, a first collection of Dunbar’s poems was published by the United Brethren Church, for which Dunbar himself paid the cost of $125. In another few years, according to McCullough’s “The Wright Brothers” book, having been discovered by the editor of The Atlantic Monthly, William Dean Howells, Dunbar had become a nationally acclaimed poet. This book is rich with such anecdotes, which is perhaps why McCullough is considered one of America’s preeminent historians. Perhaps giving some insight into Wilbur’s perceived reclusive nature, the author details a particular incident in Wilbur’s childhood that had lasting impact on him, and possibly kept him out of Yale. McCullough tells of when Wilbur was in his teens, and was struck in his face by a hockey stick. For weeks he suffered excruciating pain in his face and jaw, then had to be fitted with false teeth. Serious digestive complications followed, then heart palpitations and spells of depression that seemed only to lengthen. The alleged perpetrator of this unfortunate act on Wilbur, whom Wilbur knew well and lived only a few blocks from, would later be executed in Ohio for the murders of his mother, father, and brother, and was believed to have killed as many as a dozen others besides. Except for Bishop Wright’s brief diary mention, made available to McCullough, nothing on the subject is to be found anywhere in the Wright family correspondence or reminiscences. Nor is there much in the way of detail or firsthand description about the devastating after-effect of the accident on Wilbur. From this initial and possibly presumptive overture on the part of Wilbur Wright, a close connection and arrangement was made with Samuel Pierpont Langley, an eminent astronomer and head, or secretary, of the Smithsonian. 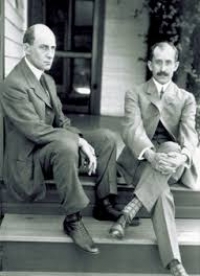 It would become quite fortuitous of Wilbur Wright to have written that letter to the Smithsonian Institution, prior to he and his brother Orville having built the flying machine or airplane, and before its first flight at Kitty Hawk in 1903, and now more than 100 years later, that vehicle being housed in the Smithsonian. 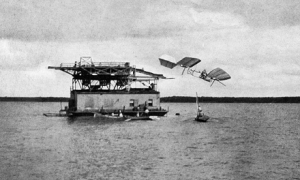 It is ironic, if not suspicious, that just 9 days prior to the Wright Brothers’ famous flight at Kitty Hawk, North Carolina, on December 17, 1903 in their “Wright Flyer”, Samuel Pierpont Langley of the Smithsonian Institution would experience his much ridiculed “aerodrome” being launched from atop a gigantic houseboat and come crashing down into the Potomac River. Making the case that Langley’s failure had been the fault of the launching device for his aerodrome, not for the machine itself, the aerodrome was taken out of storage to be tested again. When tested once more in 1914, according to McCullough’s well researched and documented book, it performed with reasonable success and the Smithsonian endorsed a statement saying, “Professor Samuel P. Langley had actually designed and built the first man-carrying flying machine capable of sustained flight.” It makes one wonder, and considering that Wilbur Wright had reached out to the Smithsonian Institution in 1899 and advised them in his thoughts and intentions, why Langley would attempt the launching of his aerodrome just 9 days before the Wright Brothers’ flight at Kitty Hawk? Could Langley and the Smithsonian have usurped the initial overtures and ideas made by Wilbur in that letter addressed to them in 1899? The author actually weighs in on the controversial and seemingly lasting debate of who was and what constitutes “First in Flight”, beyond what he says about the Smithsonian giving Langley’s “aerodrome the aforementioned endorsement of “First in Flight”, irrespective of German glider enthusiast Otto Lilienthal’s flights in 1894 and 1896, with the latter resulting in his death. McCullough does indicate that unprecedented photographs of the man deemed as the daring “Flying Man” and his gliders appeared the world over. 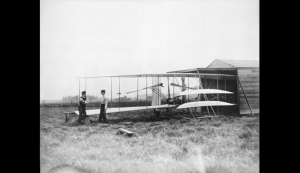 McCullough goes on to state regarding “First in Flight”: “Of further aggravation were stories of others who had supposedly achieved flight before the Wrights, the most annoying being that of a German American named Gustave Whitehead, who was said to have flown a plane of his own creation in Connecticut in 1901 and 1902. The story was entirely without evidence and wholly untrue, but kept drawing attention as the years passed to the point where Orville finally felt obliged to denounce it himself. In an article titled, ‘The Mythical Whitehead Flight,’ published in U.S. Air Services in 1945, he made plain that Whitehead was a man of delusions. Strangely, the story still draws attention, despite the fact that there is no proof.” Perhaps McCullough has not read Susan Brinchman’s Gustave Whitehead: First in Flight. This is a tremendous book, with so many stories and subplots, along with numerous historic photos and illustrations to accentuate a bygone era that has catapulted us into modern aviation and space exploration. The CBS interview of McCulloch says it all here. 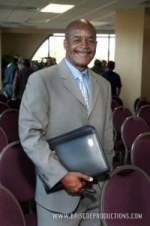 Dennis Moore is the Associate Editor of the East County Magazine in San Diego and the book review editor for SDWriteway, an online newsletter for writers in San Diego that has partnered with the East County Magazine, as well as a freelance contributor to EURweb based out of Los Angeles. 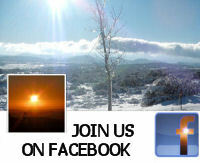 Mr. Moore can be contacted at contractsagency@gmail.com or you can follow him on Twitter at: @DennisMoore8. 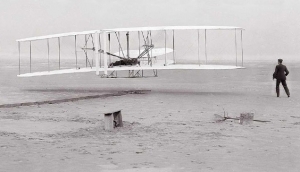 Thank you KB, although the Wright Brothers are given all the credit for being the "First in Flight", a lot can be said of Gustave Whitehead and his achievements, as chronicled by Susan Brinchman in her book: "Gustave Whitehead: First in Flight." Dennis, Because you only said "a lot can be said" we can let it go, but are you attempting start this nonsense on Whitehead again? You couldn't have been more wrong in your Brinchman review. Want to offer your best evidence that Whitehead ever flew? Your review of McCullough's book was reasonable enough to give you a pass. If you want to jump back on the Whitehead hoax promotion let's have at it. 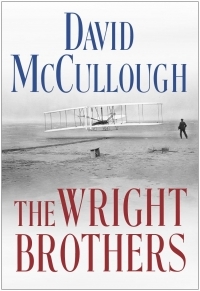 David McCullough, the author of the book entitled "The Wright Brothers" has done a brilliant job in telling the story of two ambitious brothers with an entrepreneurial spirit who forever change the world of travel. In reading Mr. Moore's review I sense that the author's facts were well researched, based on supporting evidence. The contents of the book with the many pictures tell a story about the brothers vision, and their role in making history. Dennis, thank you for such a thorough review. This book is a good source of history lesson. Jacqueline Carr - Author of "A Selected Few Just For You"
Technological breakthroughs are the stuff made by dreams, or daydreams and a leap into the unknown changing our world for better and sometimes worse. The Wright Brothers opened a new dimension that revolutionized travel, war, and brought cultures into close proximity as never before. Their story is bound to be fascinating. This is .a rich review of a complex and fascinating book. As usual, Dennis Moore has brought us up close and personal to a subject that impacts us all. The next time I see a jet streak through the sky I will think of this book and review. Thanks for your insight and curiosity Dennis, we all benefit from your literary adventures. MJ Payne, Author, The Remembered Self: A Journey into the Heart of the Beast. 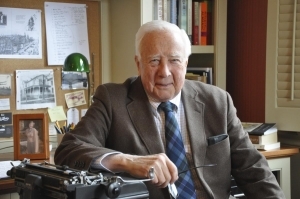 I believe I saw David McCullough on the Daily Show with Jon Stewart. His book sounds interesting. 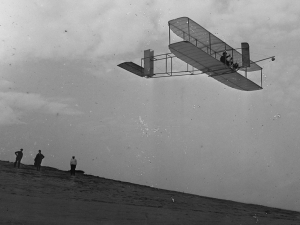 I'm inclined to believe that the Wright Brothers were proven to be the first in flight. If there was anyone before them, it can't be proven. Therefore, no proof--it didn't happen. Great article, Mr. Moore.